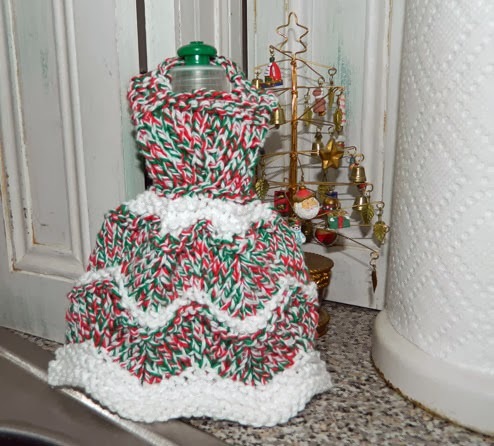 I’ve designed a special holiday season dress dishcloth knitting pattern that will be available for a limited time. This dress dishcloth pattern is available here starting today through Sunday, December 22, 2013. The pattern price is $2.49 and $1.20 from each pattern sale will be accumulated and used to purchase a Sheep through the Pass on the gift program at Heifer International. The Dress dishcloth is knit using cotton yarn from Bernat. 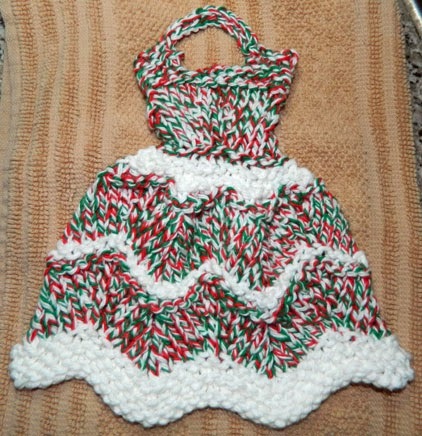 The red, green, and white yarn is called Yuletide Twists. To the right of this post is a fund raising thermometer so we can keep track of the funds collected for the sheep purchase. Thanks to all for continuing to knit and share the dress dishcloths with your family and friends. If you’ve been waiting to knit your first one, now’s the time! Here’s a Paypal Button if you’d like to make a donation towards the sheep purchase without purchasing the knitting pattern. Don’t have time or the desire to knit your own. There’s finished ones available here in my Etsy Shop. $4 from each Etsy Sale of the Mrs Claus Kitchen Helper Dress Dishcloth will go towards the sheep purchase.